The simple logo coupled with the banner and font choice truly make this site feel like a wellness product website. Great choices. 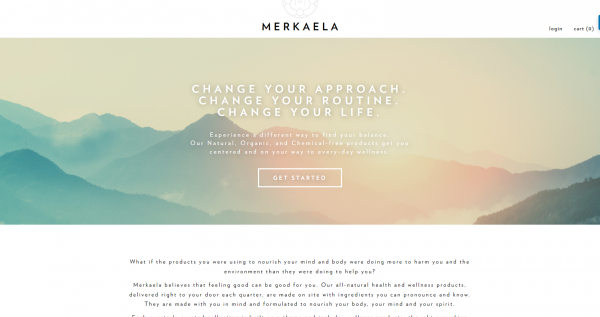 Merkaela is a luxury health and wellness subscription service providing expertly handcrafted all natural botanical products. Formulated with you in mind, we aim to create sustainable, chemical-free products that nourish the body, mind and spirit. Each month we will send you a box filled with wellness products and provide with content, mantras, and music specially curated to a particular theme. Combined, these products will create a holistic experience and support a conscious lifestyle.